The collective market’s green wave saw major coin breakout of their sluggish movement, with Bitcoin Cash [BCH] firmly leading the charge. 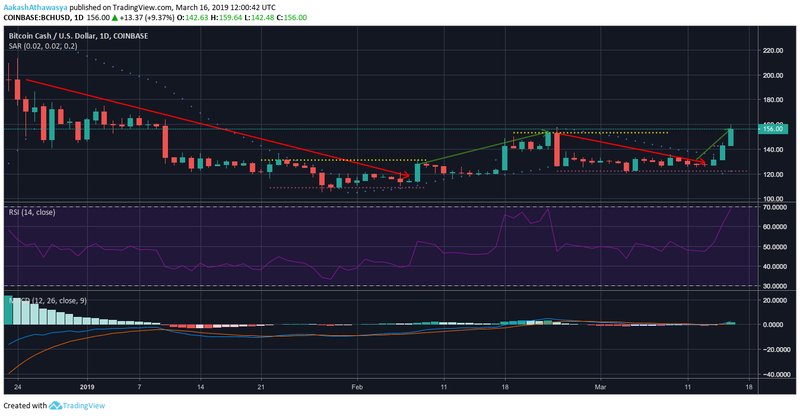 The four-month-old Bitcoin Cash hard fork, Bitcoin SV [BSV], also recorded significant gains as the market added $6 billion overnight. The sixth largest cryptocurrency in the market was the only double-digit gainer in the market, recording a whopping 18.23 percent rise, at its peak. 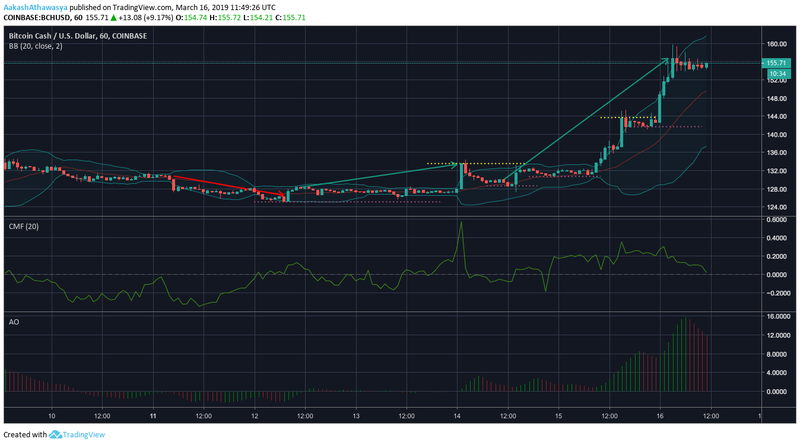 The rise followed two successive uptrends, the first of which pushed the coin from $128.33 to $133.36, and the second from $129.94 to $156.71. The coin’s market cap stood at $2.72 billion, at press time. Bitcoin Cash broke two support levels, the first at $133.54, and the second at $143.72, with a third forming around $156. The coin’s immediate support level moved up from $128.63 to $141.48, following the rise. The Bollinger Bands pointed to a massive increase in volatility as the price shot up rapidly. The Moving Average line indicated a bullish market. The Chaikin Money Flow tool pointed to positive money inflow, but dropped as the CMF line was just hovering above zero. The Awesome Oscillator indicated massive increase in short-term momentum, but since the concluding bars were red, bearish activity was in the offing, owing to market correction forces. Bitcoin Cash was switching from uptrends to downtrends, since the hard fork. The latest series saw a downtrend from $152.88 to $129.13, prior to the rise. The coin saw its first uptrend since late February on 15 March, which pushed the coin’s price from $131.39 to $156.64. The immediate support level of the coin stood at $122.24, which the coin was trading below in early February. Bitcoin Cash broke its long-term resistance, which stood at $153.26. The Parabolic SAR switched from the bears to the bulls as the dotted lines moved below the coin’s trend line. The Relative Strength Index showed a massive increase in investor interest as the RSI moved up from 47.16 to 69.20. The MACD indicated a bullish takeover as the MACD line moved above the Signal line, following the surge. Satoshi’s Vision surged forward in three successive uptrends as the market was blessed by the bulls. The first uptrend saw the price rise from $66.41 to $68.22, the next pushed the coin up from $67.35 to $69.03, and the final one from $69.02 to $71.89. Bitcoin SV was valued at $1.21 billion, at press time. Bitcoin SV found immediate support at $66.16; the previous support level stood at $65.24. The coins immediate resistance level, which stood at $68.22, was broken and a new one had formed at $71.86. The Bollinger Bands indicated a significant increase in the coin’s volatility as the price shot up. The Moving Average line indicated a bullish market, but was looking to move into the bearish zone. The Chaikin Money Flow tool pointed to negative money inflow as the CMF line dipped below 0. The Awesome Oscillator indicated a bump in short-term momentum, but since the concluding bars are red, bearish activity was predicted due to market correction forces. Bitcoin SV was reeling from a downtrend which pulled down the price from $67.94 to $75.58. The one-day chart showed three successive green candlesticks, indicating an uptrend which began at $66.86. The coin found immediate support at $61.27, which the coin last touched in the beginning of February. Bitcoin SV’s immediate resistance level was at $75.59. The Parabolic SAR pointed to a bearish market as the dotted lines moved below the coin’s trend line. The MACD indicated a bullish move as the MACD line moved above the Signal line during the surge. 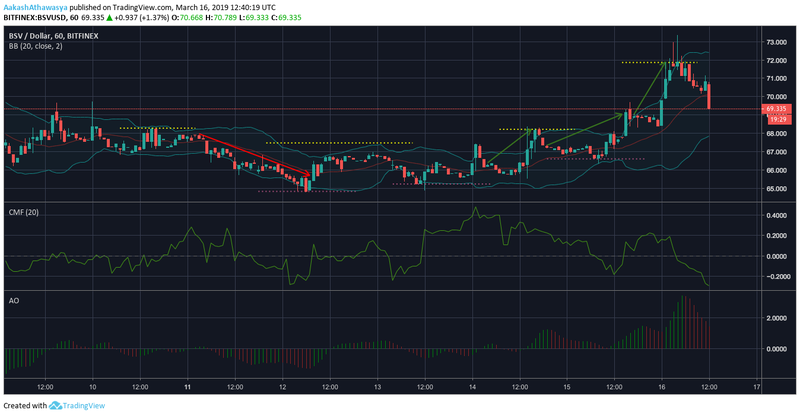 The Relative Strength Index showed a notable increase in investor interest as the RSI moved up from 42.98, to its current position of 53.48. Bitcoin Cash and Bitcoin SV saw massive surges in their respective price, owing to the collective market upheaval. However, short term indicators pointed to imminent corrections which will bring the coin’s down from their temporary high. Bitcoin Cash’s long term indicators pointed to a positive market, as investor interest was high and the MACD line was ahead. 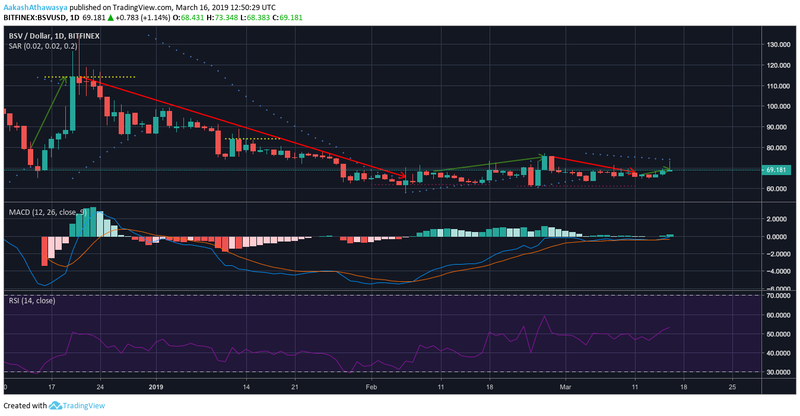 Bitcoin SV price sustainability did not look promising in the long-run, as the Parabolic SAR was still holding firm above the coin’s trend line.